John Joseph Keane. Image available on the Internet and included in accordance with Title 17 U.S.C. Section 107. Houston Buffs Logo. Image available on the Internet and included in accordance with Title 17 U.S.C. Section 107. Johnny Keane as Manager of the Cardinals, 1960s. Image available on the Internet and included in accordance with Title 17 U.S.C. Section 107. KEANE, JOHN JOSEPH (1911–1967). 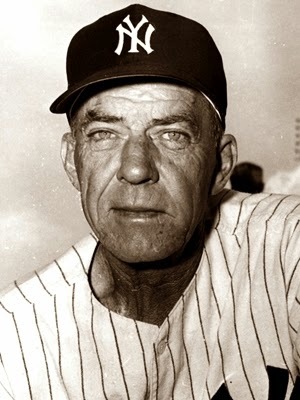 John (Johnny) Joseph Keane, major-league baseball manager, was born in St. Louis, Missouri, on November 3, 1911. His mother died when he was young, and he was raised by his grandmother. As a youth, he studied six years to become a Catholic priest but cut seminary classes on occasion in order to play semiprofessional baseball and soccer. He also played as the first-string quarterback at a St. Louis high school under an assumed name. At the age of seventeen he was about to sign a professional soccer contract, when the St. Louis Cardinals signed him and sent him to the minor leagues. He moved to Houston in 1935 to play for the Houston Buffs and appeared headed for the major leagues when he was struck in the head by a pitched ball. He was unconscious for six days and was hospitalized for six weeks. 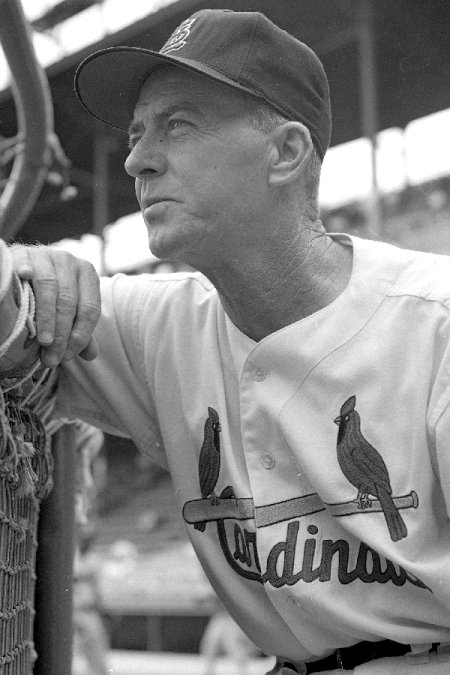 Although he played ball again after his recovery, the Cardinals decided to make him a manager in 1938. Keane managed teams in Albany, Georgia, Rochester, Minnesota, Columbus, Ohio, and Omaha, Nebraska. In 1946 he returned to Houston as manager. The next year the Buffs won the Texas League pennant and the Dixie Series. In the seventeen years that Keane managed in the minor leagues, his teams finished third place or higher eleven times and won five pennants. Keane joined the Cardinals as coach in 1959 and became manager of the team midway through the 1961 season. The Cardinals barely missed winning the pennant in 1963, after a streak of nineteen victories in twenty games. In 1964 they won the National League pennant and defeated the New York Yankees in a seven-game World Series; Keane, hailed as Manager of the Year, startled the baseball world by leaving the Cardinals immediately for the Yankees, where he replaced Yogi Berra as manager. His teams were plagued by injuries, however, and Keane was released in 1966, after the Yankees lost sixteen of their first twenty games. He next worked as a special-assignment scout for the California Angels, the job he held at the time of his death. Keane was noted for being soft-spoken and mild-mannered but also for being a strict disciplinarian. Sports writers observed that he drank little but smoked about fifteen small cigars a day, which he inhaled. He died of a heart attack in Houston on January 6, 1967. He was survived by his wife, Lela, whom he had married in 1937, and by one daughter. He was buried in Houston at Memorial Oaks Mausoleum. Eliot Asinof, "The Word for Johnny Keane Is: Patience," New York Times Magazine, May 30, 1965. Houston Post, January 7, 8, 10, 1967. Leonard Koppett, "The Big Yankee Turnabout," Sports Illustrated, June 20, 1966. New York Times, January 7, 1967. Newsweek, May 23, 1966. Jack Olsen, "That Johnny Keane Is a Fine Manager Is What He Sure Is," Sports Illustrated, April 13, 1964. Martha E. War et al., The Ballplayers: Baseball's Ultimate Biographical Reference (Metuchen, New Jersey: Scarecrow Press, 1990). Vertical Files, Dolph Briscoe Center for American History, University of Texas at Austin. Handbook of Texas Online, Joe B. Frantz, "KEANE, JOHN JOSEPH," accessed April 19, 2019, http://www.tshaonline.org/handbook/online/articles/fke01. Uploaded on June 15, 2010. Modified on April 13, 2017. Published by the Texas State Historical Association.